Clip Art for Feasts and Seasons, Celebrations and Service offers clip art in four new formats on one convenient CD-ROM for both the PC (Windows) and Macintosh. More than seven hundred quality black-and-white images are included on the CD at a resolution of 300 dpi, for the professional black-and-white graphics you want on your church, school, or personal documents. Average image size is 2 1/2 x 2 1/2 at 100%. 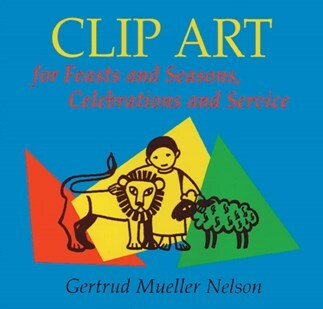 Combining the volumes Clip Art for Feasts and Seasons and Clip Art for Celebrations and Service by popular liturgical artist Gertrud Mueller Nelson, Clip Art for Feasts and Seasons, Celebrations and Service articulates Christian life throughout the year. It illustrates themes in the gospel of the three-year cycle for liturgical celebrations such as Advent, Epiphany, and Easter, as well as numerous school-year activities and works of service and ministry. The clip art images are recorded in four formats: TIFF, BMP, JPEG, and PDG. The entire set of clip art images is stored in a folder labeled as one of these formats. Image file names are the same for all formats with an appropriate Windows file extension. The CD also contains a set of contact sheets which display a thumbnail of each image with the image file name. The contact sheets are Adobe Acrobat PDF files which may be printed as a set or as individual sheets. Each contact sheet has 24 thumbnails on letter-sized paper. Each thumbnail image is linked to a catalog page for that image. Simply click on the thumbnail to go to the catalog page. The image catalog contains one image per page along with descriptive information and the image file name. The image catalog is also in Adobe Acrobat PDF format, allowing for printing or copying of each image. Descriptive information has been indexed and may be searched to locate sets of images or individual pages. This application is designed to be completely self-contained. Nothing will be loaded onto your computer system; everything needed to run the application software is on the CD-ROM. The CD is an "autoload" CD. Insert the CD into your CD reader and Adobe Acrobat Reader will start and display a catalog of images. Gertrud Mueller Nelson is an artist and writer. She studied print making in Cologne, Germany, and attended the C. G. Jung Institute in Zurich. Gertrud is familiar to many as a lecturer and, by way of many publications, for her clip art. She has also published Clip Art for Feasts and Seasons, and Clip Art for Celebrations and Service with The Liturgical Press.